Modern roundabouts are a common form of unsignalized intersection control in use throughout the world. In a roundabout intersection, there is one-way circulation of traffic around a central island where entering traffic must yield the right-of-way to circulating traffic. 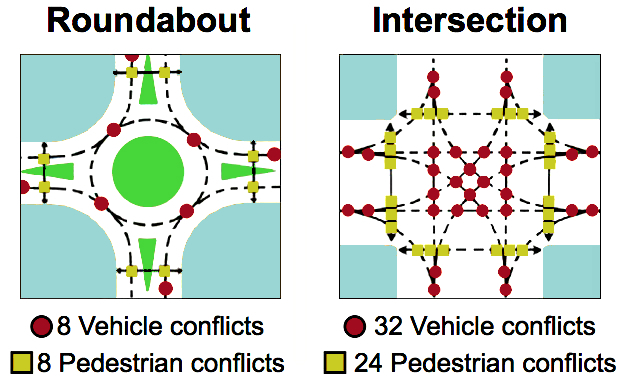 Modern roundabouts maximize safety by significantly reducing conflict points and minimize traffic delay due to the efficiency of yielding as opposed to required stopping at traditional intersections. Roundabouts are also more cost effective than traffic lights as they eliminate hardware, maintenance and electrical costs associated with the signals; this also makes them effective during power outages as no power is required to operate a roundabout intersection. A driver should use the normal rules of the road. It is important to be courteous and signal your intentions as you approach and drive through the roundabout. Drivers must be prepared to stop and wait for a sufficient gap in the circulating traffic before entering the roundabout. Vehicles already inside the circulatory roadway have the right-of-way over vehicles entering the circulation. Slow down – 15 miles per hour is about a right speed for driving in the roundabout. Yield to pedestrians, bicyclists and vehicles (the yield sign will show you where to yield). Look Left. Vehicles in the roundabout have the right-of-way. If there is no traffic in the roundabout, don’t stop. If traffic is present, wait for an opening and then enter. Once in, keep right- a roundabout is a one-way street. The circulating car has the right-of-way. Proceed with care at your exit. If you miss your exit, simply go around again. Pedestrians should cross only in the marked crosswalks. Cross only at designated crossing locations. Watch for cars; you have the right-of-way, but drivers may not be paying enough attention. 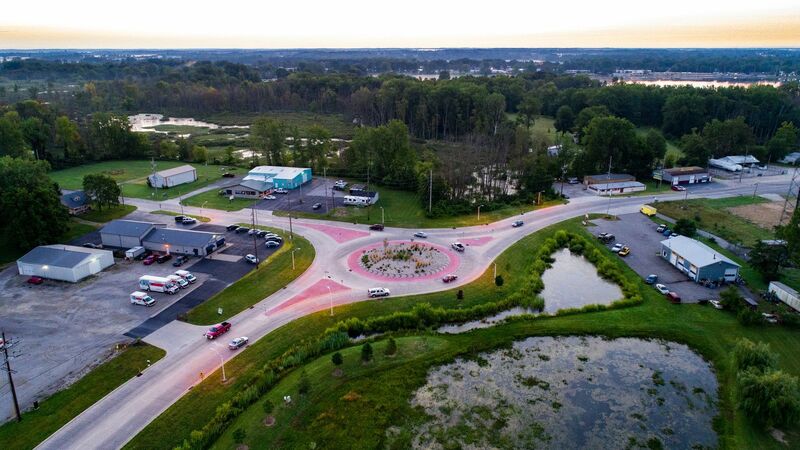 The roundabout has a splinter island that can serve as a pedestrian island, which allows you to cross the street one direction of traffic at a time. Do not cross over to the center island of the roundabout. If you are comfortable riding in traffic, take the land and circulate as you would in a vehicle. As with motorists, you must wait at the yield line for a sufficient gap in the circulating traffic before entering the roundabout. If you are unsure about using the roundabout, dismount and walk your bike as a pedestrian at the designated crosswalks.